We present a novel approach to estimate point snow instability based on snow mechanical properties from snow micro-penetrometer measurements. This is the first approach that takes into account the essential processes involved in dry-snow slab avalanche release: failure initiation and crack propagation. Comparison with field observations confirms that the two-step calculation of a stability criterion and a critical crack length is suited to describe point snow instability. We present results from simulations of the Antarctic ice sheet by means of an intercomparison project with six ice-sheet models. Our results demonstrate the difficulty of all models used here to simulate a significant retreat or re-advance of the East Antarctic ice grounding line. Improved grounding-line physics could be essential for a correct representation of the migration of the grounding line of the Antarctic ice sheet during the Pliocene. 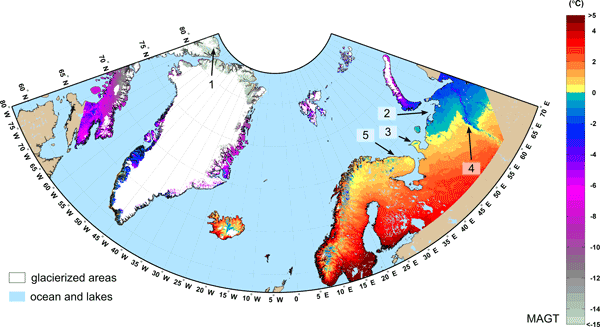 The first comprehensive study of a set of 76 firn cores in Dronning Maud Land was carried out. The δ18O of both the plateau and the ice shelf cores exhibit a slight positive trend over the second half of the 20th century. The SMB has a negative trend in the ice shelf cores, but increases on the plateau. Comparison with meteorological data revealed that for the ice shelf regions, atmospheric dynamic effects are more important, while on the plateau, thermodynamic effects predominate. A physical snowpack model SMAP and in situ meteorological and snow data obtained at site SIGMA-A on the northwest Greenland ice sheet are used to assess surface energy balance during the extreme near-surface snowmelt event around 12 July 2012. We determined that the main factor for the melt event observed at the SIGMA-A site was low-level clouds accompanied by a significant temperature increase, which induced surface heating via cloud radiative forcing in the polar region. Antarctic Peninsula ice shelves have collapsed in recent decades. The surface of Larsen C Ice Shelf is lowering, but the cause of this has not been understood. This study uses eight radar surveys to show that the lowering is caused by both ice loss and a loss of air from the ice shelf's snowpack. At least two different processes are causing the lowering. The stability of Larsen C may be at risk from an ungrounding of Bawden Ice Rise or ice-front retreat past a 'compressive arch' in strain rates. 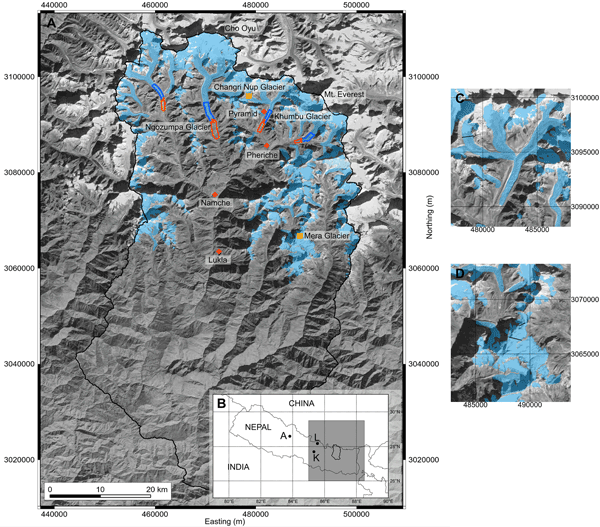 In this paper we describe surface and thermal offsets derived from distributed measurements at seven field sites in British Columbia. Key findings are i) a small variation of the surface offsets between surface types; ii) small thermal offsets at all sites; iii) a clear influence of the micro-topography due to snow cover effects; iv) a north--south difference of the surface offset of 4°C in vertical bedrock and of 1.5–-3°C on open gentle slopes; v) only small macroclimatic differences. The Storfjorden polynya (Svalbard) forms regularly under the influence of strong north-easterly winds. In this study, spatial and temporal characteristics for the period 2002/03-2013/14 were inferred from daily calculated thin-ice thickness distributions, based on MODIS ice surface temperatures and ERA-interim reanalysis. With an estimated average ice production of 28.3km³/winter, this polynya system is of particular interest regarding its potential contribution to deep water formation. 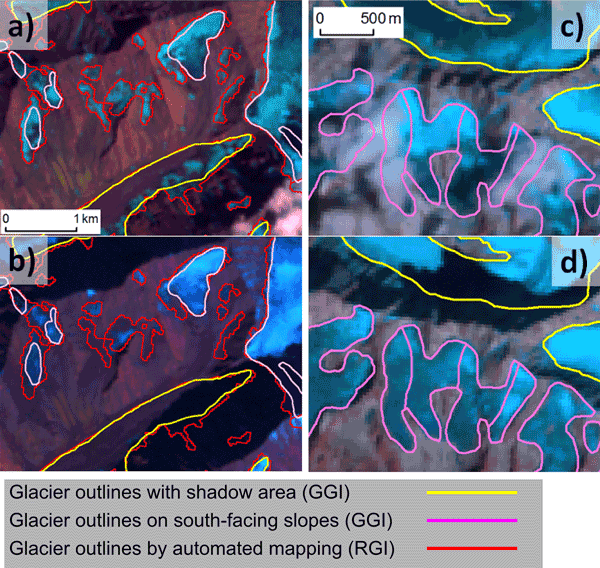 This study presents a method for estimating annual accumulation rates on a temperate Alpine glacier based on the interpretation of internal reflection horizons in helicopter-borne ground-penetrating radar (GPR) data. In combination with a simple model for firn densification and refreezing of meltwater, GPR can be used not only to complement existing mass balance monitoring programmes but also to retrospectively extend newly initiated time series. We performed 2H isotope diffusion measurements in the upper 3 metres of firn at Summit, Greenland, by following over a 4-year period isotope-enriched snow that we deposited. We found that the diffusion process was much less rapid than in the most commonly used model. We discuss several aspects of the diffusion process that are still poorly constrained and might lead to this discrepancy. Quantitative knowledge of diffusion is necessary for use of the diffusion process itself as a climate proxy. 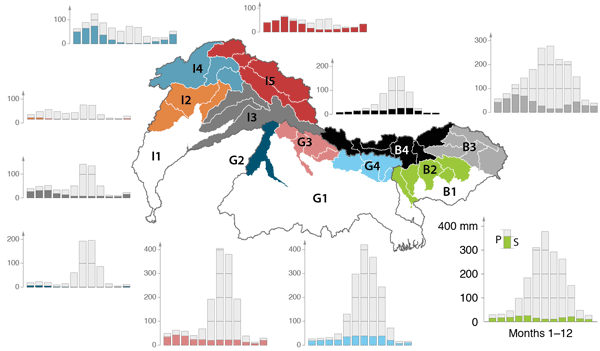 Using a dataset from 12 weather stations collected in 2010 and 2011, we analyzed the air temperature variability and wind regime over three different glaciers in the Ortles-Cevedale. The magnitude of the cooling effect and the occurrence of katabatic boundary layer processes showed remarkable differences among the three ice bodies, suggesting the likely existence of important reinforcing mechanisms during glacier decay and fragmentation, with significant impacts for glacier mass balance modeling. Floating ice shelves extend the continental ice of Antarctica seawards and mediate ice-ocean interactions. Many ice shelves are incised with channels where basal melting is enhanced. With data and modeling it is shown how the channel geometry depends on basal melting and along-flow advection (also for channels which are not freely floating), and how channel formation imprints the general flow pattern. This opens up the opportunity to map the channel formation from surface velocities only. The paper provides detailed information on the outcome of a user survey carried out in the EU FP7 project CryoLand. The project focuses on monitoring of seasonal snow, glaciers and lake/river ice. The user survey showed that a European operational snow and land ice service is required and that there exists products that can meet the specific needs. The majority of the users were mainly interested in the snow services, but also the lake/river ice products and the glacier products were desired. This paper presents an assessment of changes in the near-surface structure of the accumulation zone of the Greenland Ice Sheet caused by an increase of melt at higher elevations in the last decade, especially during the unusually warm years of 2010 and 2012. The increase in melt and firn densification complicate the interpretation of changes in the ice volume, and the observed increase in firn ice content may reduce the important meltwater buffering capacity of the Greenland Ice Sheet. Climate-trends data in Himalaya are completely absent at high elevation. We explore the south slopes of Mt Everest though time series reconstructed from 7 stations (2660-5600m) during 1994-2013. The main increase in temp is concentrated outside of the monsoon, minimum temp increased far more than maximum, while we note a precipitation weakening. We contribute to change the perspective on which climatic drivers (temperature vs. precipitation) led mainly the glacier responses in the last 20 yr. In this article, we present a methodology for the objective evaluation of the error in capturing mean snow depths from point measurements. We demonstrate, using LIDAR snow depths, how the model can be used for assisting the design of survey strategies such that the error is minimized or an estimation threshold is achieved. Furthermore, the model can be extended to other spatially distributed snow variables (e.g., SWE) whose statistical properties are comparable to those of snow depth. The thermal conductivity of Arctic snow strongly impacts ground temperature, nutrient recycling and vegetation growth. We have monitored the thermal conductivity of snow in low-Arctic shrub tundra for two consecutive winters using heated needle probes. We observe very different thermal conductivity evolutions in both winters studied, with more extensive melting in the second winter. Results illustrate the effect of vegetation on snow properties and the need to include it in snow physics models.